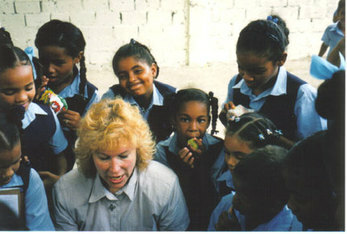 Kelly traveled on a medical/evangelistic mission to Santo Domingo with a team from Omaha, Nebraska. Two ophthalmologists, three physicians, and two nurses joined the team. They fit 417 patients with eyeglasses, all donated by churches in the U.S., and filled over 500 medical prescriptions. ​Kelly took her keyboard, leading the worship services in churches and at the Anglican school (left). She also had opportunity to go door-to-door in the neighborhoods, witnessing for Messiah. We brought new vision to the people there, both physically and spiritually!